As the auto industry was starting at the beginning of the last century, there were very few cars on the road. There were very few roads to drive on. Ransom Olds was struggling with what to build in the new Olds Motor Works factory in Detroit. He hit upon a vehicle with a non-traditional curved toboggan like front end. During the winter of 1900-1901, Olds tested several variations of the vehicle on adjacent Belle Isle in the Detroit River. The product passed the tests and Olds decided to go into production. 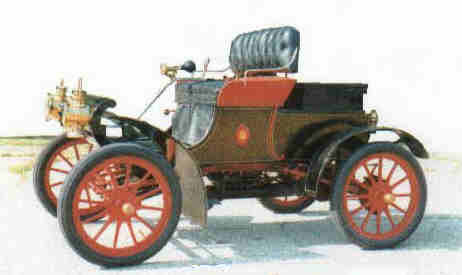 Advertising started in February 1901 for the little 650 pound, $650 car destined to be called the Curved Dash Oldsmobile. Orders started rolling in and by March over 300 had been placed with the factory. Success was at hand. However, as fate would have it on March 9. 1901 the Detroit Plant caught fire and burned to the ground with the exception of the separated foundry building. What to do now? Olds decided to clear the foundry building and use it as an assembly building. He would purchase parts from Leland, the Dodge Brothers, Brisco and others to fill the void in the manufacturing plant. The Lansing Businessmen's Association decided to entice Olds back to Lansing with the gift of the old Central Michigan Fairgrounds, a 52 acre parcel on the south side of town. Olds accepted and built a new plant in Lansing and rebuilt the Detroit plant just as it was before the fire. At the end of 1901 Olds had produced 425 Curved Dashes in the temporary foundry assembly plant. He also had two new plants ready to make cars at the unheard of rate of 20 cars/day in each location. Volumes would soar to over 4,000 cars per year. The Curved Dash became the most popular car in the United States with nearly 40% of the car market. Curved Dashes were being sold all over the world from Europe to Asia to Australia. Other carmakers were struggling to make 20-30 cars per year and Olds was doing it in a day or two. The forerunner of the modern moving assembly line was developed. It was called progressive assembly where each chassis was assembled on a castered assembly stand that could be moved from place to place to improve the process. Henry Ford came to the factory to learn how to make cars and later created the mechanical moving assembly line. He would go on to make millions of Model T's. The Curved Dash was made through 1907 although by 1905 volumes had started to drop. The auto market was changing. People wanted cars with more power, that could carry more people with a little more comfort and speed. Olds philosophy with the Curved Dash was to create an inexpensive, easy to operate, durable car for the masses. He succeeded. He also helped create the supplier industry we know today, trained a great variety of future carmakers and ingredients necessary to be a success. He had a good product, an excellent plant and a marketing program. He recognized that the competition was the horse not other carmakers. Most carmakers in this timeframe lacked one of these elements and failed. Ransom Olds can rightfully be called the "Father of the Auto Industry". along the Grand River in Lansing, Michigan in 1901? Click here to read the history of the land before Oldsmobile.